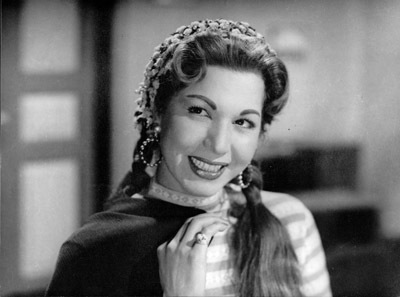 ZEINAB KHALIL, a young countryside girl who moved to Cairo in the early 40’s and appeared in the nightclub arts scene suddenly. 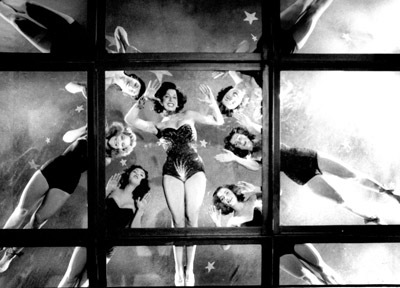 Her first appearance was in the Badeia Masabny’s famous nightclub in which she presented many of the today’s named stars of dance, cinema and theatre actors, actresses and singers. Badeia received this young girl and recognised her potential and handed her over to a very prominent dance teacher of that time named Jacque, who trained her in the arts of Ballet, Jazz Tap, Contemporary Modern Dance as well as of course helped shape and develop her own approach to her home grown Egyptian Baladi style. 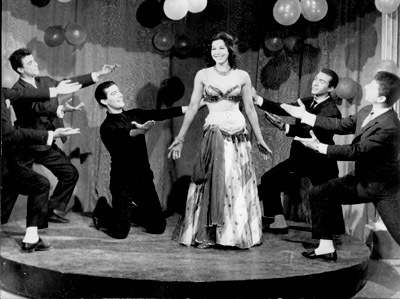 This prepared the young Zeinab Khalil for joining the Badeia troupe of dancers as one of the chorus line dancers who would be spread around the queen of show time Badeia. 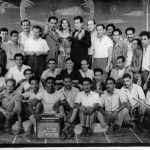 Then Badeia noticed her even more as the one dancer in her troupe who executed all the dance routines perfectly and was leading the rest of the dancers in rehearsals as well as in performances, and gave front-line positions and named her the stage name of “SAMYA GAMAL”. 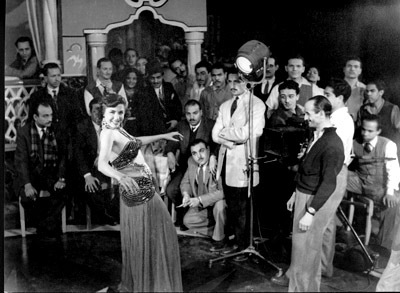 During that period of time of Samya’s starting in the Badeia Masabny Club there was another young dancer who started a short time before her and was ahead of her as far as being presented to the audience in solo spots as well as gaining her own fame and admiration by the club frequenters, her name was Taheyya Karioka. 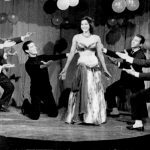 Quite soon after that Badeia gave the young Samya her solo spots in the show, as well as having her, like Taheyya singing and dancing in the sketches with monologists and sometimes the comedians who required a good dancer to bounce off for their show. A very strong friendship was struck between Taheyya and Samya, and I am presenting to you 2 extremely rare photographs that present their united feelings and remained friends until the last days of Samya, which came a few years before Taheyya’s. 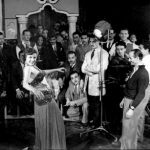 During her work in Badeia’s club, Samya also struck a strong friendship and kinship for a young foreign singer from Lebanon, who was not yet recognised by Badeia or the audience. His name was Farid Al Atrash. The opportunity came and Farid was given his solo parts in singing in the club, and he was becoming more and more admired for his unique voice and compositions. A love story that echoed and still echoes until today happened between Samya and Farid. It was her very first and most important love story that changed her life completely. (Please refer also to the article on Farid Al Atrash). 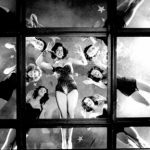 Samya continued on her artistic road with her excellent Egyptian Dancing and next to her work in the club, she only did some private, and very highly profiled weddings and functions, but never in other nightclubs. 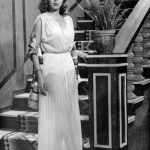 Samya’s first chance in acting came slightly earlier than her colleague Taheyya and it was in a film by the director Farid El Gendy. The film was called “Min Fat Adimo” (He who has no past has no Future). However, this film died a terrible death and was a terrible box office flop. But this was no fault of any of the people who worked on the film in any way. It was a political film about a particularly terrible and corrupt member of the parliament who was not in office at the time of making the film. But alas, by the time the film was finished he came to be prime minister. 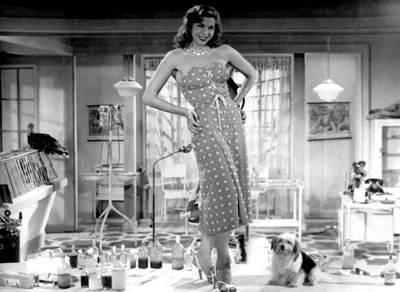 Of course needless to say, the film went under the chopping scissors of the censorship department, which left the film as a bunch of completely unrelated, non-sequitur picture clips that were incomprehensible. The nasty part is that it was released in the cinemas, which made all the actors and people who worked on the film look very idiotic. This put Samya out of the film business for a few years, until she was given a supporting role in some minor level films, and she shined through those. But during all this time, dancing was her main love and centre of her life and she searched and was seeking the top composers and arrangers to make her music for her, as well top choreographers to work on her dancing as well as costume designers and makers of that time. 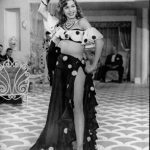 She even travelled abroad to dance in Lebanon and Syria, and she was very well received there and became a household name. Her love story during all that time was growing stronger with Farid who had started in cinema as well, but as he was singing and acting in films by other producers and directors, it was impossible for him to insist on her playing opposite him in those films. His first film was called “Entisar El Shabab” (The victory of Youth) in which he starred opposite Rawheyya Khaled, and the second film was “Ahlam El Shabab” (Dreams Of The Youth), in which starred opposite the legendary actress Madiha Yousry, and a third film “Gamal We Dalal” (Beauty and Coyness) in which he appeared with dancer Beiba Ezz Eddin, but she was the girlfriend of the film producer. When Farid decided to produce his own films he could never dream of producing it without the apple of his eyes, Samya. 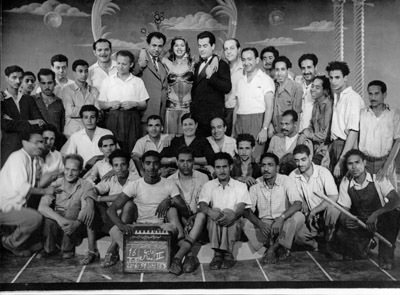 The film was named “Habib El Omr” (The Love Of My Life). And success showered the two lovers like an avalanche of amazingly good luck. The more their love and relationship got stronger and the fire between them was burning with powerful flames, the more this attracted the eyes of people and admirers as well as those who were jealous. To be precise, Samya had a very rich admirer who was trying his best to attract her attention, showering her with presents, jewellery, money and property in an attempt to drag her away from Farid and have her for himself. However, Samya was very clear and straight with him and told him that her heart is closed and the key to the lock was in Farid’s pocket. Put her admirer did not relent and tried every possible way, he even produced a film the story of which was about this woman who was an artist and who was in love with another fellow artist, and the story ends with that the love from the man was false and pretentious and cheating her, while there was another “true” admirer who was very keen on her and who was showering her with his love and gifts and she was not reciprocating his love, and when her beloved left her and let her down, no one stood by her except that other lover, forgiving her and loving her even deeper and stronger, even though as an artist she almost reached the stage of setting down like the sun at sunset. The film was named “Al Ghoroub”(The Sunset). 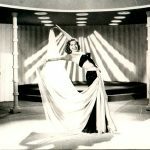 Of course, Samya knew what he was trying to say in that film, and she understood his intentions in that action, but she still accepted the leading role in the film and presented some of her best dance routines while continuing her love and close relationship with the love of her life, Farid. The film was completed and the preview night was the night when all the leading artists and all the film crew would be there, as well as a big host of who is who in the cinema and art world would come. This is the night when her admiring producer has kept for the special occasion when he will present her with a contract for three new films, and a check with an advance on each of the three films, not forgetting his undying love and a proposal of marriage. This type of evening would end in a big party and a big banquet dinner that would be remembered by all. However, Samya did not attend that preview evening or the party and spent the night with her beloved Farid laughing their heads off at his opponent. All this was very strong fathers in the cap of their love and close kinship until the time came and Samya asked Farid to be married and crown their relationship and love with the honest thing to do, however he delivered a bomb that shattered not only her heart but all her dreams and hopes and killed a certain sparkle in her magical host of emotions she felt for him and because of her love for him. Farid said that as he comes from a royal family from the Druz Mountains, it would be an unforgivable shame to his people and they would actually kill him, or disown him if he married a dancer/actress. Samya would have preferred to have been hit by a runaway train at that moment and wished she was dead instead. 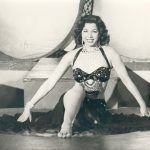 She closed her doors and became a recluse who never saw anyone for a while, but the work offers kept coming and were met with refusals until she was offered to work as a dancer in some European nightclubs which she accepted and thought of it as something that will help her forget her tragic shock and heart burning memories. 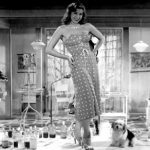 She also accepted a film offer for a film leading in front of a Lebanese singer called Mohamed Mar-ie, who did not make it too big in the art world except for one song “La Ya Helow La” (No, my beautiful one, No). 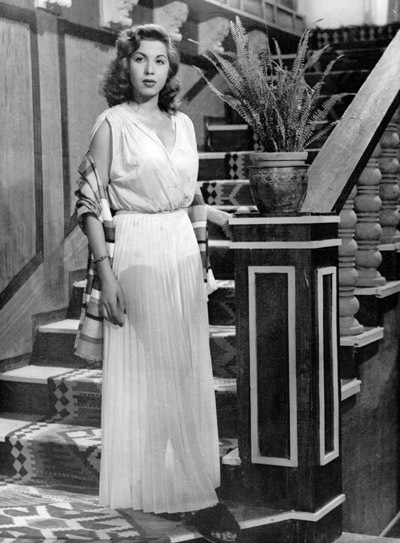 When Samya returned to Cairo and worked in some of the clubs, she met an American gentleman by the name of Jack King, a man who was a ranch owner and who fell madly in love with her and wanted to marry her and take her back to the United Sates. Samya felt that there was no reason not to get married and travel abroad again. Jack King announced his conversion to Islam and was named Abdullah King, and they married and off she went to the United States. Samya kept touch with all her friends in Cairo and it was only one year before she asked for a divorce and returned to Egypt to continue with her artistic career. 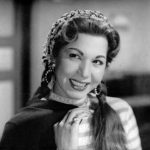 A few months later, Samya met Roshdy Abaza, an Egyptian film star, who was an extremely attractive man and was the star of the screen who broke all the young women of Egypt’s hearts by getting married to Samya. They lived together happily, raising his daughter until she was married off and Samya retired from the world of artistic performing. In 19// Samya made a short comeback to the world of dancing and was very well received, and celebrated the re-launch into the world of stardom with a private party that was thrown for her by the great composer of Egypt the Mohammed Abdel Wahab, who had previously composed dance pieces especially for her. This artistic comeback lasted only for a short period of time when she retired permanently and she lived alone until her final day. 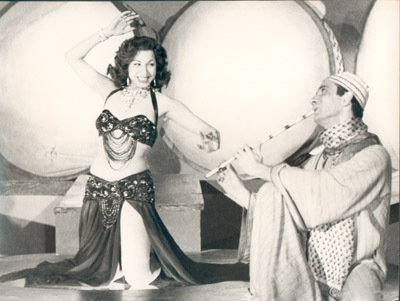 During the amazing and exciting artistic life of Samya Gamal the dancer there was a big turning in the fashion of dancing that we may take a short stop to have a quick look at. 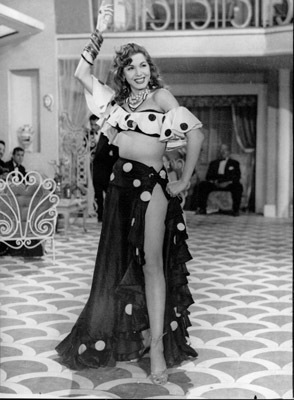 Samya was the first dancer to dance barefooted. Usually ALL the dancers danced with shoes until one night Samya was presenting a show and during her involvement with the heat of the music, rhythm and complex choreography, one of her shoes slipped off or broke, and she quickly ripped off the other one and danced barefoot, which was a major cause for admirations and applause by the audience who respected her bravery and courage to dance barefooted. 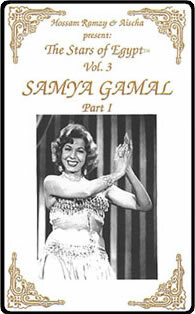 It was said that the very next evening all the dancers in all the nightclubs in Cairo where dancing without shoes, as if dancing barefoot was a fashion invented by Samya Gamal. As we are stopping at this type of story, here is another one for you: This story involves King Farouk the last king of Egypt before the 1952 revolution and Samya Gamal. This is a rumour that was invented and is NOT true. 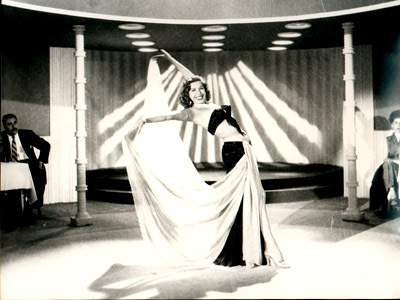 As with all royal banquets, particularly when there would be foreign guests, a Dance show would be presented and would be the featured highlight of the evening’s entertainment. 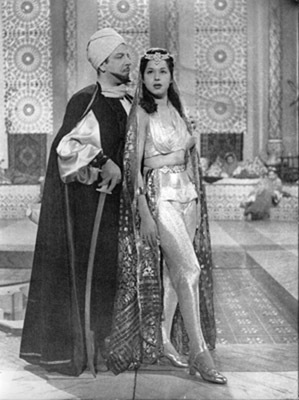 Samya was one of the dancers who was invited over and over and over and over again to the point that it was the cause of some sick minded people’s doubts, particularly those who were very keen to tarnish the king’s reputation and to turn the public’s opinion on him as a womaniser, and named Sama “The Official Royal Dancer Of Egypt”, however, various trusted sources in the art world, and who were very close to Samya confirmed again and again that Samya was never involved with the king and that the man who may have called for her by name to dance in his banquets, had never passed on more than admiration for one of his country’s prominent artists.